The subject of a post-apocalyptic social meltdown is fast becoming the new direction for horror cinema – at least if films like Chernobyl Diaries (2012) are any indicator. This apocalyptic chiller by debut director Bradley Parker, starring Devin Kelley, Jonathan Sadowski, Ingrid Bolsø Berdal and Nathan Phillips, is truly tense throughout, which is strange considering that the storyline is so riddled with generic cliches that it should barely be able to hold itself together. In 1986, Reactor #4 at the Chernobyl nuclear power plant in the Ukraine exploded, contaminating everything for miles around. The local city of Pripyat, where the facility’s workers and their families lived, was evacuated immediately and the area became a ghost town. Twenty-five years later, six youngsters are touring Europe together and in Kiev they meet Uri (Dimitri Diatchenko), whose company offers ‘extreme’ tours of the abandoned town of Pripyat. Following some persuasion the group decide to go for the day trip – after all, with the area deserted for 25 years and radiation levels now negligible, what could possibly go wrong? When Uri takes an ‘alternative’ route after being turned back from an army checkpoint on the borders of the city, you’d have also thought that alarm-bells would start ringing in the tourists’ heads. Which they do, but only once the group finds their van tampered with on returning from a walk around the city. It’s then they realise the area is not as deserted as they first thought – a discovery which may have come too late. 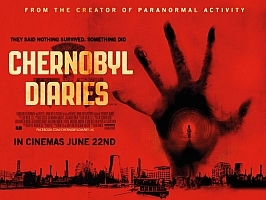 Nothing about Chernobyl Diaries should be remotely frightening. From the dodgy Uri and his suspect business set-up – one glimpse of which would send any normal person running in the opposite direction – to transport which doesn’t start when you need it most, the standard fright-fest scenarios are signposted in flashing neon lights well in advance. Yet despite all this, Parker’s Chernobyl Diaries still somehow works. The slow build-up, interspersed with false start shocks – a scene in one of Pripyat’s abandoned apartment blocks is particularly good – works throughout, the true perpetrators of the ensuing horror remaining hidden for much of the film. Mix this with frenzied performances by the young cast and wonderfully creepy location choices and the result, though no classic, is definitely enough to make you rethink going on a suspect European coach trip anytime soon.